Knebworth Classic Motor Show will rock! Home » Knebworth Classic Motor Show will rock! The Knebworth Classic Motor Show, celebrating its 28th anniversary this year, is set to welcome up to 1,000 classic cars and collectable vehicles on Sunday 26th and Monday 27th August. 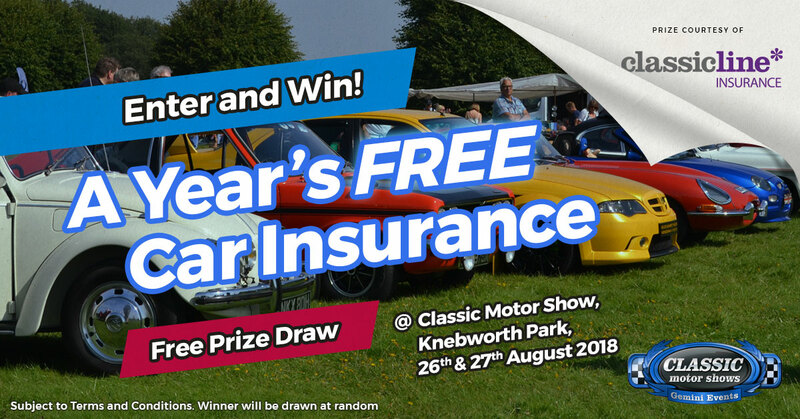 To mark the occasion the headline sponsors, ClassicLine Insurance, have a special prize draw where one lucky person will win a year’s free car insurance worth up to £250. The prize draw is one of many highlights which will see hundreds of classic cars on display, including saloons, sports, American, commercial, military and classic motorcycles. The Knebworth Classic Motor Show has everything for the perfect day out. Other highlights of the show, organised by Gemini Events, include a live arena which hosts a series of parades and interviews, together with the famous ‘Decibel Duel’ to find the loudest vehicle. There’s also plenty of activities for families, with admission to the Knebworth Fort and Gardens included in the admission price. The Herts Motor Show also takes place, allowing visitors the opportunity to view the latest cars from a wide selection of manufacturers. Ian Fray, managing director at ClassicLine Insurance, said: “The Knebworth Classic Motor Show has everything for the perfect day out. There’s plenty for all to enjoy, hundreds of classic cars, a live arena, plus the attraction of the Fort and Gardens. For more information, including ticket prices for the Knebworth Classic Motor Show, visit the Gemini Events website.